Pneumatic seals operate typically in air or other gaseous medium. All AHP Seals Rod seals are Non-symmetrical. Non-symmetrical Pneumatic rod seals are seals whose cross section, when viewed from a cut away, is not symmetrical or the same on each side of the center line. A Non-Symmetrical rod seal can only be used as a rod seal and not as a piston seal. For your unique or special Pneumatic Seal application, contact our engineers to help you in specifying a seal that’s best for your situation. At American High Performance Seals, we pride ourselves on manufacturing the most durable pneumatic seals. Utilizing advanced materials designed specifically to offer our customers maximum durability, we manufacture the widest array of seal and material options to meet industry’s challenging fluids, temperatures, surface speeds and pressures. Most standard and custom-made pneumatic seals are available with a 1-4 day turnaround. 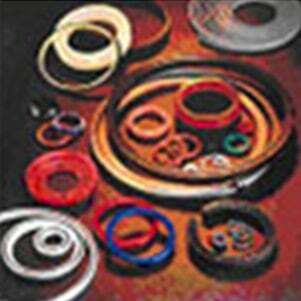 Our extensive range of seals are available in a wide variety of sizes and materials. Our materials include: Polyurethane, Nitrile, Viton®, H-Nbr, high-performance Polyurethane, water resistant (hydrolysis resistant) Polyurethane, EPDM, Silicone, FDA compliant materials, Aflas®, Hytrel®, Kalrez®, UHMWPE, Tefzel®, Nylon, Nylatron®, Engineering Plastics, Peek, and a range of proprietary-filled PTFE (PTFE). Many special Duralast™, Permachem™ and Duraloy™ Engineering Plastics and Elastomers were developed to match real-world applications, and on many occasions we have developed a special grade to address a customer’s application difficulty. American High Performance Seals, Inc.
Why American High Performance Seals ?